Jack Quinn and Nancy Cordes are our guests this week. Original Air Date: August 6, 2011 on SiriusXM Satellite Radio “POTUS” Channel 124. During last week’s broadcast of Polioptics, legislators where huddled together in the Capitol trying to break a stalemate and negotiate a debt ceiling compromise that would save the United States from its first ever default. A deal — such as it was — was eventually struck, allowing the President to sign the bill into law alone in the Oval Office accompanied only by a large handful of signing pens. Since then, other then his well-reported 50th birthday bash, the President and Washington haven’t had much to celebrate. A 500 point drop in the Dow Jones Industrial Average led Wall Street to its worst day since the 2008 crash, leading to a new round of headlines about Americans are worried about a double-dip recession. As if matters couldn’t get worse, Standard & Poors, in one of those classic mid-Summer late Friday night revelations of bad news, downgraded the credit rating of United States debt one notch from its AAA rank to the less distinguished AA+ level. Joining us this week on Polioptics to discuss the the implications — and to reflect on a certain debate between former Vice President Al Gore and billionaire Ross Perot — Jack Quinn, former Chief of Staff to the aforementioned Gore, White House Counsel to President Bill Clinton and, since leaving public service, Chairman of Quinn Gillespie & Associates. If you want to take a trip back to 1996 — before MSNBC, before Fox News Channel, before the Drudge Report, when Ross Perot could command national attention by debating a sitting Vice President on the pending NAFTA legislation — take a look below. In our discussion with Jack, he takes us back to the run-up to that debate, when Perot called him a “young whippersnapper.” On our show, Jack does a vivid Perot imitation. Jack is one of the top lobbyists in Washington, always found on the upper reaches of those who wield the most power from K Street with influence extending one way to Capitol Hill and the other way to Pennsylvania Avenue. As one operative very much attuned to the persuasion of polioptics, Jack also writes his own blog, chipping in this view recently about the debt debacle. Reflecting on a career in Washington that started in 1969, Quinn demonstrates, in his conversation with Adam and Josh, that he understands the nuances of government as thoroughly as anyone. If Jack Quinn was watching the debt debacle from the rarefied redoubt of K Street, Nancy Cordes of CBS News was wearing a flack jacket and reporting on it — day-in, day-out — from the front lines. Nancy joins the conversation with Josh and Adam at Polioptics to offer listeners a sense of life in the foxhole when covering a story with plenty of incoming shrapnel. That kind of story is nothing new for Nancy Cordes, though she readily admits on Polioptics that this one had a unique sense of history. 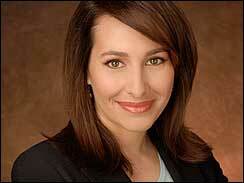 Prior to joining CBS News in 2007, Cordes was an ABC News correspondent based in New York, where she covered Hurricane Katrina, the war in Iraq and the 2004 election. Prior to joining ABC News, Nancy was a reporter for WJLA-TV Washington, D.C., where she covered the Sept. 11 attack on the Pentagon, the 2000 Presidential race, the D.C.-area sniper attacks, and peacekeeping efforts in Bosnia. Here’s Nancy covering breaking news for CBS — the 2009 crash of a Washington Metro Train. And a little more recent work (though you don’t see much of Nancy), her interview with ex-Rep. Anthony Wiener in the early days of his Twittergate Scandal, which would soon explode, leading to his resignation. From Anthony Wiener at the beginning of the June to the debt debacle that culminated in August, Nancy Cordes has certainly earned her summer vacation.